Patent valuation for SEP’s is the subject of much heated debate amongst patent holders and implementers, and is a taxing issue for Courts and regulators worldwide. Negotiations in SEP licensing in the telecoms sector have invariably relied on some kind of patent counting as SEP holders boast about the size of their portfolios, and recent Court decisions in the UK (such as Unwired Planet vs Huawei) and in the US have used counting techniques. Key to understanding the strength of any patent portfolio is to consider its size relative to that of the wider patent landscape. Within the IP industry it is well understood that not all patents are equal – that there are many patents that are “low quality” and that many have questionable validity. Some studies estimate that as much as 80% of declared SEPs are not in fact essential and may be invalid. It should therefore be of no surprise that not all SEPs are created equal. Some SEPs cover key, core technical elements of standards, while others cover lesser aspects that perhaps do not contribute to the state of the art outside of the standard itself. While the principle of treating all SEPs as equivalent has been historically convenient, the resultant proportionality approaches to licensing and damages means patent portfolios consisting of low quality patents can be treated on a par with much higher quality innovations. Today’s analytical approaches allow us to compare patent metrics across portfolios and landscapes to at least determine proxies for patent quality, and make broad judgements as to the relative strengths of one portfolio to another. Counting patents and SEPs are often-used methodologies, but ignore strength factors. Relying on assessments of essentiality alone ignores the question of patent quality and innovation strength. We believe an additional analysis of strength factors can significantly contribute to the identification of value within patent portfolios relative to the wider SEP landscape. We recognise that SEP analysis is still a necessary, and complementary element, but we no longer accept the idea that all SEPs must be treated equally. 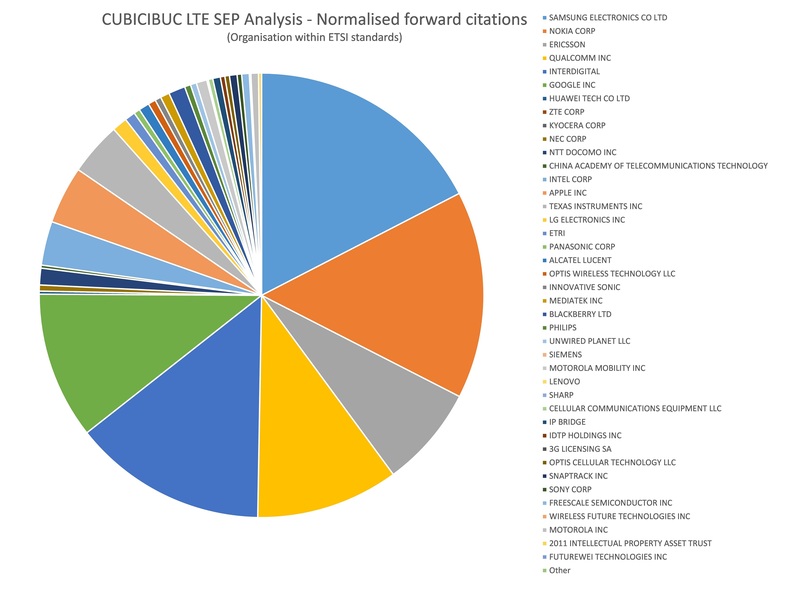 With this background, CUBICIBUC has produced an analysis of the LTE SEP landscape (over 5700 patent families identified from ETSI’s IPR database relating to LTE projects) that considers several widely accepted metrics for patent quality – particularly age normalised forward citations within the closed group of a standards organisation. 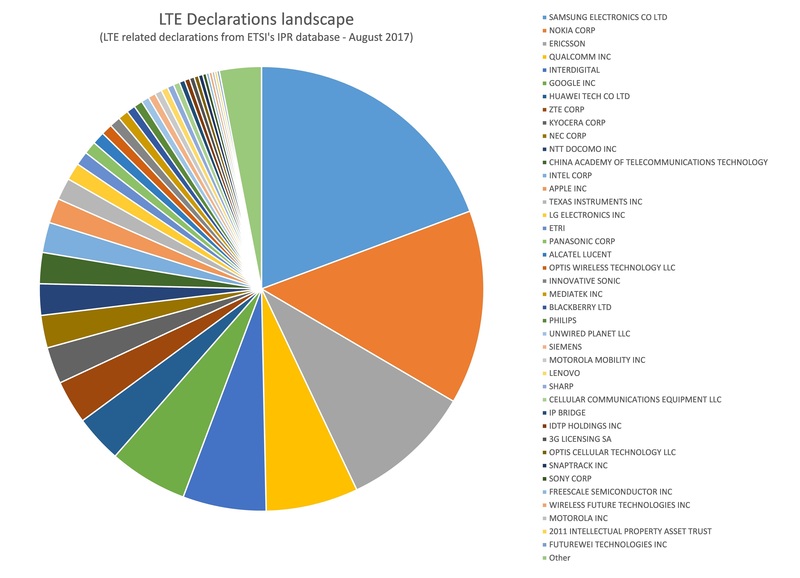 Figure 1 below is the basic breakdown of the LTE declared SEP landscape at ETSI in August 2017, showing the shares of the “declared landscape” using a standard patent counting technique. Our more detailed analysis demonstrates that SEP patent portfolios do not all exhibit the same characteristics, and the portfolios of many well-known SEP holders fall very short of others within the wider landscape. The analysis shows how the share of the landscape change when patent metrics are normalised with weighted forward citations (normalised for age and weighted for ETSI member organisations). The results from our analysis support the evidence from the market place that claimed SEPs cannot be considered to be of equal value. CUBICIBUC’s analysis provides benchmarks and tools enabling licensors and licensees to build robust FRAND offers. Our LTE report provides detailed analysis of the strengths of all declared LTE SEPs across the wider LTE landscape. The Report is critical for SEP holders to see how their portfolios compare to others, and critical for those companies negotiating SEP licenses, so they can understand how the SEP claimant’s portfolio measures up in strength and innovation. Our report analyses the strengths of the portfolios of numerous SEP holders. Examples of our analysis include the shares of Apple and Intel, as summarised below. The table below shows an example extract for Intel Corp and Apple Inc, showing in this case the share of the declared landscape compare to two metrics: the share of the average weighted forward citations and a value “Forward50” which thresholds citation counts, counting only those with at least 50 forward citations. In both cases shown above Intel Corp and Apple Inc perform better – taking a higher share of the analysed landscape. 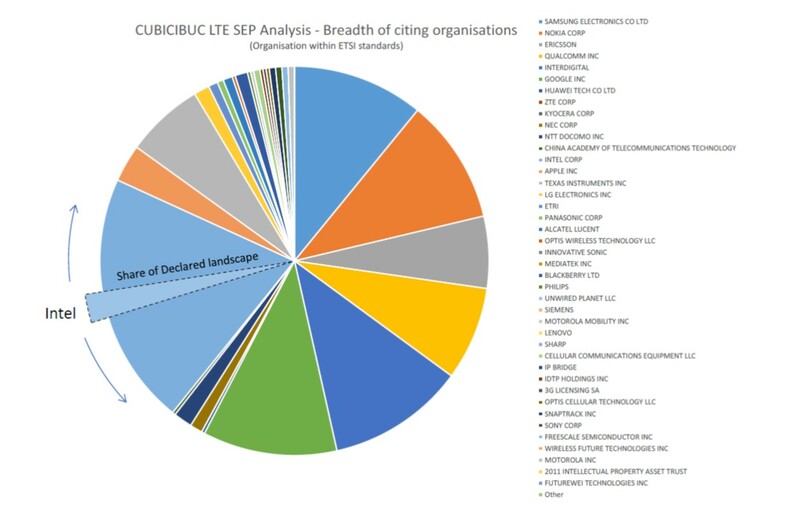 The second example extract below again shows analysis for Intel Corp and Apple Inc, here comparing the share of the declared landscape to analysis for the breadth of citing organisations – how many unique organisations (in this case other ETSI members) cite the patents. As above, two metrics are used: more than average for the landscape and with a threshold of at least 5 non-self-organisations. In both cases shown above Intel Corp and Apple Inc perform better – taking a higher share of the analysed landscape; in particular Intel Corp’s share of the landscape, when considering those patents with at least 5 citing organisations, shows an almost x10 increase. This can be seen diagrammatically in the figure below for Intel where their share increases from 2.2% (of the declared SEP landscape) to 20.4% (of the weighted landscape analysis).